We’d love your help. Let us know what’s wrong with this preview of One Square Inch of Silence by Gordon Hempton. To ask other readers questions about One Square Inch of Silence, please sign up. I really want to love this book. I strongly support Gordon's mission. But this is an interesting idea and a few good stories buried within page after page of reiteration and senseless descriptive narrative. I highly recommend reading the first chapter or two, and learning more about the One Square Inch project; we even took the hike to visit it. But I cannot recommend reading this entire book. I consider myself a fairly aware and in-tune with nature person and I like to think that I use all of my senses - sight, smell, taste, touch, hearing when interacting with the world around me. However, reading this book I realized how immune I've become to sounds around me. On a daily basis, I experience such a barage of human-made sounds, many of which are loud and unpleasant to my ears, that I've taught myself (unconsciously) to tune them out. In this book, Hempton goes in search of silence wh I consider myself a fairly aware and in-tune with nature person and I like to think that I use all of my senses - sight, smell, taste, touch, hearing when interacting with the world around me. However, reading this book I realized how immune I've become to sounds around me. On a daily basis, I experience such a barage of human-made sounds, many of which are loud and unpleasant to my ears, that I've taught myself (unconsciously) to tune them out. In this book, Hempton goes in search of silence which he defines as 15 seconds of natural sound uniterrupted by human made noise. 15 seconds is not a very long time and one would think that finding 15 seconds of Hempton's "silence" would be fairly easy to come by. Traveling from the Olympic Pennisula in Washington state to Washington DC, Hempton tries to find silence. He visits national parks and wilderness areas only to be met time and again with aural assaults on his ears. In this age of "conservation" and "sustainability" Hempton demonstrates (in writing and with sound meter readings) the importance of adding natural quiet to these lists. Easy to read, funny, and sometimes heartbreaking this book has changed the way I listen. Realmente interesante esta suerte de viaje "sonoro" en busca del silencio en EEUU. Un libro ameno, inspirador, y que me ha hecho pensar, y mucho, en los paisajes sonoros que nos rodean en nuestro día a día y, ante todo, en si alguna vez volveremos a ser capaces de escuchar el sonido del silencio en este mundo cada vez más avasallado por la mano del hombre. This book makes me want to go hiking in the Olympic rain forest. I remember camping here as a kid and waking up in the morning and everything was wet: outside of tent, inside of tent, any clothes inside of tent. The best strategy was stuffing clothes inside of sleeping bag so that they would be a bit dry and warm in the morning. Also remember the moss. Everything was covered in moss. Moss on the ground, moss covering all of the logs on the ground, moss hanging from the trees. And I want to back t This book makes me want to go hiking in the Olympic rain forest. I remember camping here as a kid and waking up in the morning and everything was wet: outside of tent, inside of tent, any clothes inside of tent. The best strategy was stuffing clothes inside of sleeping bag so that they would be a bit dry and warm in the morning. Also remember the moss. Everything was covered in moss. Moss on the ground, moss covering all of the logs on the ground, moss hanging from the trees. And I want to back to Canyonland NP. The most stars that I have ever seen! Five stars for the message, four for the messenger. Gordon Hempton's message on silence is one that needs to be heard. I gave it three stars though, because the writing and storytelling skill doesn't match the passion for natural quiet. The pace is slow, which is appropriate, but the storytelling lags and meanders. Travels that have the opportunity to pull us in with the adventure of pursuing silence, read like a journal, documenting Hempton's morning ablutions, coffee breaks, and travel discomforts. Far too much of the book documents various sou Gordon Hempton's message on silence is one that needs to be heard. I gave it three stars though, because the writing and storytelling skill doesn't match the passion for natural quiet. The pace is slow, which is appropriate, but the storytelling lags and meanders. Travels that have the opportunity to pull us in with the adventure of pursuing silence, read like a journal, documenting Hempton's morning ablutions, coffee breaks, and travel discomforts. Far too much of the book documents various sound levels. Rare was the page that didn't say something along the lines of 'ARMY JET = 110 dBA.' Travel anecdotes from strangers and friends Hempton encounters on his trip are poorly transitioned into the overall story. It is clear that Hempton has a natural skill for sound recording, but less so for writing. The author writes some of the most amazing descriptions of sound I have ever read. He is clearly a talented listener. I agree with some other reviewers that the frequent decibel level readings became tedious. His focus is on jet flight over national parks. However, he seems a little naive about how to go about changing anything. Who are the people that could? For me as a user of national forests and parks my biggest concerns are snowmobiles and helicopter tours. Jets are also an intrusion, but n The author writes some of the most amazing descriptions of sound I have ever read. He is clearly a talented listener. I agree with some other reviewers that the frequent decibel level readings became tedious. His focus is on jet flight over national parks. However, he seems a little naive about how to go about changing anything. Who are the people that could? For me as a user of national forests and parks my biggest concerns are snowmobiles and helicopter tours. Jets are also an intrusion, but not as bad in my view. A must-read - a book that has made such a huge impact upon me, having me in a state of high-alert as far as auditory observations since I picked it up and started reading. Fascinating - and saddening, while at the same time encouraging! I love the cause. The overall narrative of a cross-country search for quiet is promising, yet often the individual episodes are flat. The constant chronicle of noise level becomes repetitive. There are however lots of great research in science, history and literature that went into the book, and I’m very interested to read more by John Muir now! I enjoyed reading this, but it's kind of sad. There are almost no quiet places left in the US. I love stories of obsession, however this one just left me wanting to stop at times. It bogged down in a couple of places. A number of years ago I read an article in Sun Magazine either by or about Gordon Hempton, and the whole concept of appreciating and preserving quiet struck a loud chord in me, so to speak. I am blessed by the privilege of living in the mountains - the Swiss Alps -and we all cringe and cover our ears (or at least I usually do) when the Swiss Air Force erupts through the sound barrier. For years my profession as a conference interpreter meant that my ears were my most important working tool. The A number of years ago I read an article in Sun Magazine either by or about Gordon Hempton, and the whole concept of appreciating and preserving quiet struck a loud chord in me, so to speak. I am blessed by the privilege of living in the mountains - the Swiss Alps -and we all cringe and cover our ears (or at least I usually do) when the Swiss Air Force erupts through the sound barrier. For years my profession as a conference interpreter meant that my ears were my most important working tool. The advent of omnipresent earbuds made me almost laugh - just like tight shoes, removing the headsets at the end of a long session was such a relief - who would inflict that on oneself voluntarily! In the 1990s the French television equivalent of "60 Minutes" aired a section titled "La Musique qui rend sourd" (The Music which deafens), and when I began working at a boarding school with teenagers, I used some connections to get a copy of the film. So this book was probably preaching to the converted. I bought it more as a tool for a talk I hope to give here at the school where I continue to work - both about protecting and preserving silence and protecting and preserving hearing. The book itself was perfect in many ways, although I found the beginning intensely irritating. I had to close out some of Hempton's voice which I've read other Goodreads reviewers qualify as "whiny". Likewise the vision of Hempton continuously whipping out his decibel meter was a bit off-putting, and I was almost glad when at some point he describes an event and only later realizes he forgot to take a measurement. At the same time I do understand and appreciate the value of actually documenting the decibels. I'm still a bit fuzzy on the technical sides of decibel measurement, but I'm very clear on the value of silence and the need to stop filling everything up with background music. Years ago, watching a film production of King Lear, it was only in the very last scene that I realized that part of what I had experienced as the intensity of the film was the absence of background music. The final scene, with Lear walking alone on a beach, bereft but for the sound of the waves, the wind and the screech of gulls, was immensely powerful. Just last summer, setting off on a hike with a group of teens and young adults, I quite shocked one of the young men, when I asked him to turn off his portable music appliance. He had difficulty imagining that everything was not necessarily better with music being played along. I had no issues with live singing, just didn't want to have to listen to background music while hiking through the woods. Some parts of this book were quite poetic, and I felt the writing improved as it progressed. A fascinating and thought-provoking journal of Gordon Hempton's effort to protect one square inch of quiet within a designated spot of the Olympic National Park. In memoir fashion, Hempton describes a little of his pilgrimage experience to the quietest place within the park, as well as his journey across country (from West Coast to Washington, DC) hoping to advocate for less human-generated noise ~ at least in designated parks and wildernesses. I learned alot about the generation of human noise, h A fascinating and thought-provoking journal of Gordon Hempton's effort to protect one square inch of quiet within a designated spot of the Olympic National Park. I learned alot about the generation of human noise, how it impacts humans, and how starkly it adversely impacts other species. Having read the book, I'm now more aware of the noise around me. As much as I enjoyed the reading, I was disappointed that a self-identified acoustic ecologist wasn't more self-reflective about his own noise generation. 1) He drives to the shore to body-surf as a way of cleansing before he goes into the forest. He drives in the opposite direction in order to prepare to protect the quiet?! 2) He drives a VW van, which has its own problem with noise generation. Then he admits that he has a second, much newer SUV. Seriously?! Two big polluters in terms of sound! 3) He takes the VW on a two-month pilgrimage, which is noise enough. But then he blithely takes a commercial flight back to his home twice during that trip, in order to attend some family celebrations. Yet there is no mention of how much noise his own convenience causes. The other issue I have with him from an ecological standpoint is that he uses "silence" and "quiet" interchangeably. Only humans generate noise? And reducing human noise leads toward silence (instead of a quieter ecosystem where other natural sounds can be heard? That's just like describing a piece of land as a "vacant lot," when in fact it is quite robust and thriving with grasses, small mammals, insects, and worms ~ it isn't vacant ~ and to say that it is vacant is only to perceive it with respect to human usage. If he had been just a little more self-aware about his own lifestyle generating noise ... and just a little more sensitive to using language that isn't entirely anthropocentric, this would have been a 5-star read. This is a remarkable book, and one I will cherish. I've included 'diversity--understanding' among my tags, because I've never thought so much about silence, quiet, the quality of sound and our human relationship to sound and quiet before. This perspective is such a gift! Ken Burns says of this book, "After awhile we begin to sense that silence is our greatest teacher." Acoustic ecologist Gordon Hempton takes us on a journey from One Square Inch of Silence (OSI) in the Hoh Valley, Olympic Nationa This is a remarkable book, and one I will cherish. I've included 'diversity--understanding' among my tags, because I've never thought so much about silence, quiet, the quality of sound and our human relationship to sound and quiet before. This perspective is such a gift! Ken Burns says of this book, "After awhile we begin to sense that silence is our greatest teacher." Acoustic ecologist Gordon Hempton takes us on a journey from One Square Inch of Silence (OSI) in the Hoh Valley, Olympic National Park, Washington State to the C & O Canal, the National Park Service and the FAA here in Washington, DC-- listening, and seeking to find and preserve vanishing quiet in our landscape. Precious peace! One Square Inch is an effort to protect quiet in one part of the Olympic Rain Forest, affecting many square miles around it and creating the first quiet preserve in the nation. Wonderful! I wasn't sure for the first 20 pages whether I'd love or hate this book. It's quirky in its detail--lots of "2:13 am, 60 dBA plane overhead" comments--and I thought that might really bother me. (It didn't; I grew to have enough familiarity with the numbers that I had some sense of proportion.) I ended up loving it, both for the descriptions of natural "silence" (which often isn't silent at all) and for the optimism that we can preserve it. I need a lot of silence in my life, and reading this gave I wasn't sure for the first 20 pages whether I'd love or hate this book. It's quirky in its detail--lots of "2:13 am, 60 dBA plane overhead" comments--and I thought that might really bother me. (It didn't; I grew to have enough familiarity with the numbers that I had some sense of proportion.) I ended up loving it, both for the descriptions of natural "silence" (which often isn't silent at all) and for the optimism that we can preserve it. I need a lot of silence in my life, and reading this gave me a different perspective on it. I hear much more mechanical noise in my very quiet home office. I hear traffic when I'm drifting off to sleep. In some ways, I'm sorry to be so much more alert; I used to think my environment was quiet. At the same time, it makes the problem of maintaining silent places much more immediate. Hempton seems to have the same reaction to backpacking that I do, and he writes beautifully about the need for wilderness and silence. This book is amazing. I wanted to start reading it before I head to raft the grand canyon in a week. I thought it would give me some good insight and give me something to think about while traveling one of the 7 wonders of the world. The concept that Hempton has revolving around one square inch of space is inspiring. It makes me think about what really is important in life and what we take for granted on a daily basis. I have 5 days before i leave, and I really want to finish the book before i g This book is amazing. I wanted to start reading it before I head to raft the grand canyon in a week. I thought it would give me some good insight and give me something to think about while traveling one of the 7 wonders of the world. The concept that Hempton has revolving around one square inch of space is inspiring. It makes me think about what really is important in life and what we take for granted on a daily basis. I have 5 days before i leave, and I really want to finish the book before i go so that I may spend my week in the canyon listening to nature and wondering what it is I may do to help preserve what is left. Who knows, maybe I may even try to create my own square inch. How amazing would that be...I better get back to the book, I got a feeling ill be up late reading tonight. This was a pretty good book. Not the best but definitely not the worst. The only thing that it has against it is that it is the same thing over and over. The author goes to one place while his car rattles apart, tries to find a quiet place and talks to those who remember the good ole days. Don't get me wrong I wish I could experience the good ole days when technology and noise didn't pervade every single facet of our lives. It was just repetitive in this book. I started reading this on a road tri This was a pretty good book. Not the best but definitely not the worst. The only thing that it has against it is that it is the same thing over and over. The author goes to one place while his car rattles apart, tries to find a quiet place and talks to those who remember the good ole days. Don't get me wrong I wish I could experience the good ole days when technology and noise didn't pervade every single facet of our lives. It was just repetitive in this book. I had heard Gordon Hempton on NPR, talking about his work recording natural sound, especially his trip around the world, recording the songs of birds at daybreak. 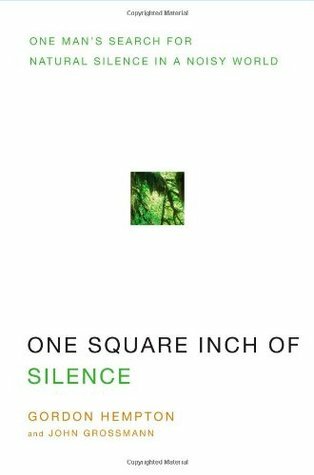 This book is about his quest to preserve "One Square Inch of Silence" of a place where the only sounds are natural ones. He has a place in a National Park in Washington state. Even that place is intruded upon by the noise of planes flying over, at least one an hour. It is full of wonderful descriptions of places, and made me think abou I had heard Gordon Hempton on NPR, talking about his work recording natural sound, especially his trip around the world, recording the songs of birds at daybreak. It is full of wonderful descriptions of places, and made me think about sound in a different way. He points out that hearing is a sense that is always "on" -- we can close our eyes, but not our ears. I don't think I have even been conscious of being in a place without machine sounds. He has amazing descriptions of the natural soundscape of a valley, as an overall "hum" of the sounds and the way they move within the landscape. I heartily agree with the idea that our world is too filled with non-natural noise and that we as a society must take steps to preserve natural silence as a connection to our world, reinvigorating our now dulled sense of hearing. The author takes a journey from the Pacific Northwest to Washington, D.C., seeking the last bastions of silence along the way. His journey, the measuring of noise levels, and the number of times a man made noise interrupts the quiet caused me to pause and consider when I I heartily agree with the idea that our world is too filled with non-natural noise and that we as a society must take steps to preserve natural silence as a connection to our world, reinvigorating our now dulled sense of hearing. The author takes a journey from the Pacific Northwest to Washington, D.C., seeking the last bastions of silence along the way. His journey, the measuring of noise levels, and the number of times a man made noise interrupts the quiet caused me to pause and consider when I was last able to hear the breathing of the earth. Be sure to listen to the CD included with the book. This review has been hidden because it contains spoilers. To view it, click here. The stories about Hempton's efforts and travels are interesting, the cause is important, and Hempton's interview with On Being is one of my favorite podcast/radio episodes to date (and it led me to this book). While I highly recommend the podcast (http://www.onbeing.org/program/last-q...), I have some reservations about the book. The way Hempton writes about his teenage daughter, her attitude during the trip, and her decision to leave the trip earlier than planned seems, at best, uncharitable. Th The stories about Hempton's efforts and travels are interesting, the cause is important, and Hempton's interview with On Being is one of my favorite podcast/radio episodes to date (and it led me to this book). The way Hempton writes about his teenage daughter, her attitude during the trip, and her decision to leave the trip earlier than planned seems, at best, uncharitable. That section of the book and the follow up at the end (highlighting how she was "bashing" the project and had broken her promise to participate) both bothered me quite a bit. I love silence. this is not the only book I have about it. I'm a quaker, so it's appropriate, and being a quaker has grown my appreciation for silence and my love of it. it's rather dismaying how little silence - even when you simply define silence as the absence of mechanical/electronic noise - is available in the US. hempton exhaustively traveled and paid attention to flight patterns, etc. he found the quietest place in the US and he's trying to preserve it, which is cool. some resources are h I love silence. this is not the only book I have about it. I'm a quaker, so it's appropriate, and being a quaker has grown my appreciation for silence and my love of it.